Party Vision LLC is an entertainment provider of inflatable rentals, photo booths, casino night equipment, laser tag, interactive fun rentals, sights and sounds rentals, fun foods and concessions, games, performers, and more. Offering theme packages, Party Vision is a complete entertainment resource for larger events and festivals. Don’t hesitate to contact Party Vision LLC today and reserve your entertainment rentals . . . Activate this business listing. Tags: CT Inflatables, Entertainment Rentals for Large Events in New England, Inflatable Rentals in New England, Inflatable Rentals NY, MA Inflatables, New York Festival Rentals, NY Inflatables, PA Inflatables, Party Vision, Party Vision Entertainment, Party Vision Festival Rentals, Party Vision Inflatable Rentals, Party Vision Inflatables, Party Vision LLC, Party Vision New England, Where to rent inflatables in New England? New England Party Rentals Get your bounce rental for your special event the way you want it with New England Party Rentals. Serving the New England area including Massachusetts, Connecticut, and Rhode Island, call today and reserve an inflatable rental for your graduation, company picnic, Old Home Days, lawn fetes, after prom party, birthday party, backyard get together, and any event large or small . . . Activate this business listing. 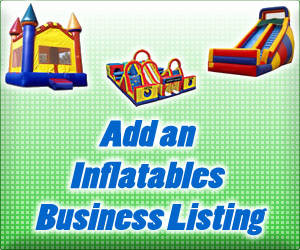 Tags: Bouncy House Rentals in New England, CT Bouncer House, CT Moonwalk, CT Moonwalks for Rent, MA Bounce Rentals, MA Inflatables, MA Moonwalk Rentals, New England Bouncey House, New England Party Rentals, Rent inflatables New England, RI Inflatable Rentals, RI Inflatables, Where to rent Bounce Houses in Rhode Island? KEC Party Rentals offers many forms of party and event rental equipment including inflatables, bounces, combos, interactives, and slides, photo booth, flip books and glitter tattoos, laser tag, advertising inflatables, power jump, climbing rock wall, tent rentals, mechanical bull, dj and foam party service, mini golf and carnival games, movie nights and fun food rentals, and more . . . Activate this business listing.